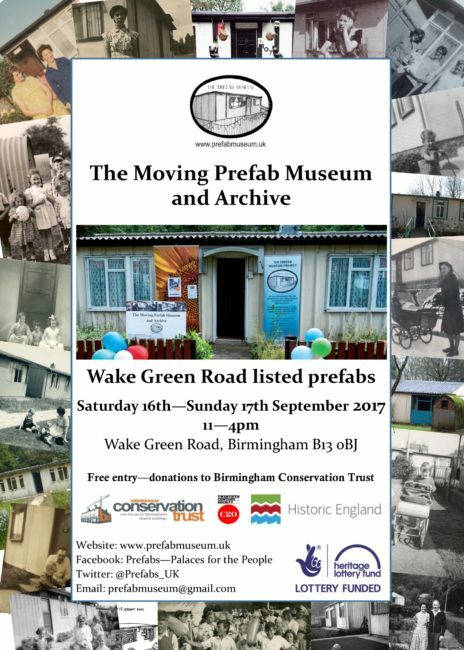 Birmingham Conservation Trust, in partnership with the Twentieth Century Society and the Prefab Museum will carry out work to consider how best to preserve the Wake Green Road prefabs in the Birmingham suburb of Moseley, thanks to a £4,000 grant from Historic England. The Trust will investigate how best to conserve and restore these buildings and share the history of the dwellings that were originally built as temporary accommodation after the Second World War. This will involve establishing the current state of the properties, planning restoration work and considering the best uses for the buildings: most of which are people’s homes. The much-loved, cottage-style bungalows stand as a row of 17 at the southern end of Wake Green Road backing on to the Shire Country Park. Although more than 100,000 were built after the war – with 4,000 in Birmingham – only several hundred still exist. In 1998 the significance of the Wake Green Road buildings were formally recognised when 16 were listed with Grade II status by Historic England. This is the largest collection of listed prefabs in the country. Built in 1945 by mass builders Laing, McAlpine and Henry Boot, the Phoenix-model prefabs were erected as a result of the 1944 Housing (Temporary Accommodation) Act. Prefabricated houses could be quickly and easily put up using factories geared for wartime production, using largely unskilled labour. All round the UK, these temporary solutions to the post-war housing problem have far outlived their ten-year life expectancy. These prefabs have national historic and cultural significance. They play an important role in the memories of many Brummies, and the Birmingham Conservation Trust wants to secure their future for generations to come. Although they still stand proud more than 70 years on, appearances can be deceptive, and for some it is more about being able to keep standing at all. The Trust is determined to ensure a meaningful future for these important buildings, especially for the people who live there and love them. Of the 17 bungalows, ten are occupied by Birmingham City Council tenants and one is privately owned.